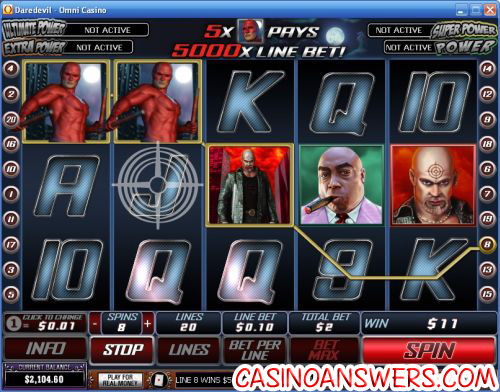 Daredevil Movie Video Slot Guide & Review - Casino Answers! The Daredevil video slot is a 5 reel, 20 line video slot. It has a Bullseye feature, 4 Mystery Progressive Jackpots, offers 10 free games with Random Wilds and has a max prize of 5,000 credits X Line Bet. You can find the Daredevil video slot at Omni Casino. You can bet from $0.01-$0.10 per line, thus the max bet is $2 per spin. This makes the Daredevil slot machine excellent for casual online casino players. You can get 10 free games if you get Random Wilds. After every spin, Daredevil’s radar sense scans the reels and random turns symbols on the reels into wilds. 0, 1, 2 or 3 symbols turn into wild every time. Random Wild substitutes for all symbols except scatter. Scatter wins are paid before Random Wilds are distributed. Extra free games can be won infinitely. The Marvel Daredevil video slot includes a Bullseye feature. Before a spin, place the Bullseye target on one of the 15 reel positions. Place the target by clicking on the reels. If after a spin the Bullseye symbol ends up under the target, you win 3x the total bet. The target will remain in its last position until you move it to a new position. The feature is active in the main game only. There are four Progressive Jackpots in the Daredevil video slot game. 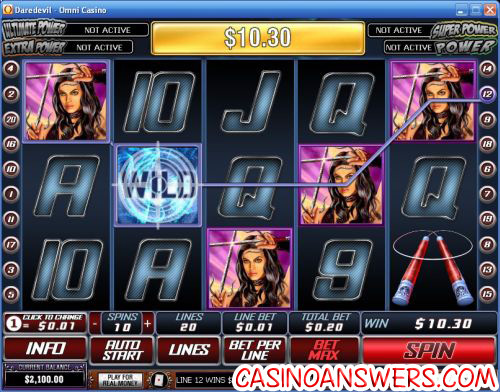 All Marvel slots are linked to four Mystery Progressive Jackpots: Power, Extra Power, Super Power and Ultimate Power. All four jackpots are won randomly. Any spin of any amount in the Daredevil video slot can win entry to the jackpot game including spins with no game wins. However, the higher the bet, the bigger your chances are of entering the jackpot game. Entering the jackpot game guarantees a win of one of the four jackpots. The jackpot game has a 4X5 grid of 20 squares hiding different jackpot symbols. Click of the squares to reveal jackpot symbols. Match 3 identical jackpot symbols to win that jackpot. The jackpot game has a reaction timer. The jackpot timer will be paid automatically if you don’t react fast enough. Whether or not you are a fan of the comic, enjoyed the film or are familiar with the character, the Daredevil video slot provides a lot of excitement with all of its special features. Even Matt Murdock can see that it’s a lot of fun. We think you should have a few spins of it at Omni Casino! Where can I play the Daredevil slot machine? You can find the Daredevil video slot at select Playtech online casinos. We recommend you play it at Omni Casino, which offers a 100% up to $100 signup bonus, a 50% up to $200 second deposit reload bonus, weekly Sunday bonuses and includes one of the best casino VIP loyalty programs you can find! Does the Daredevil slot feature any Progressive Jackpots? All Marvel slots on the Playtech platform have four Progressive Jackpots; Power, Extra Power, Super Power and Ultimate Power. All four jackpots are won randomly, regardless of what symbols you receive on your spin. Any spin can win, but the higher the bet, the greater your chances are! What Marvel Progressive Jackpots are there? Where can I play the Marvel Daredevil video slot?